Okay, so we’ve only been on the road for two weeks, but that doesn’t mean that the affordable comforts that Bangkok has to offer is not much needed and appreciated. The best meal I’d had up until arriving in Thailand was on our ANA flight, if that says something! It feels good to indulge a little on this Bangkok layover before we head north. Even with the currency rate lower than usual, we foreigners cannot complain about $1 streetside meals, budget aircon rooms on par with Western standards, and nightly Thai massages. But back to the food. 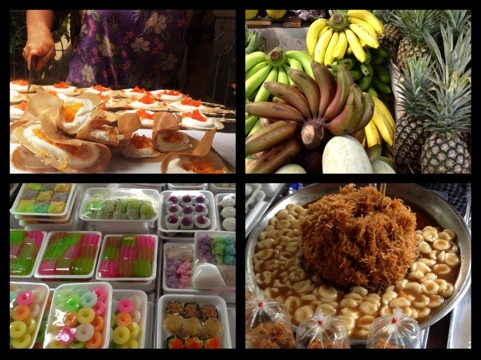 It is my belief that most Thai street food snacks were originated in a 5 year old’s imagination who knows that the best treats consist of coconut, sweetened condensed milk, nuts, merengue, custard, some mango perhaps. I have no idea how some of these creations were invented, but I am in agreement with them! We’ve basically been eating our way through the city. First lunch, second lunch, first dinner, etc. And usually tropical cut fresh fruit or fruit shakes in steady intervals throughout the day. 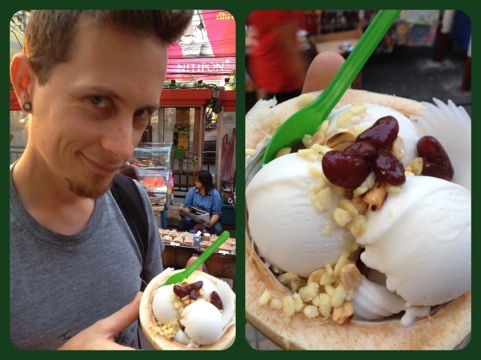 I’m making up for my “Philippine Vegetarian Diet”, which basically meant I was hungry for the 10 days we were there! Thailand is known and respected for it’s street food, and truly this is an eating culture. I imagine street food here became popularized as folks seem to be always on-the-go, and thus they eat on-the-go. And they are constantly eating! Day, night- in restaurants, malls, stores, streets, indoors, outdoors- Thai folks seem to fiercely enjoy their food.